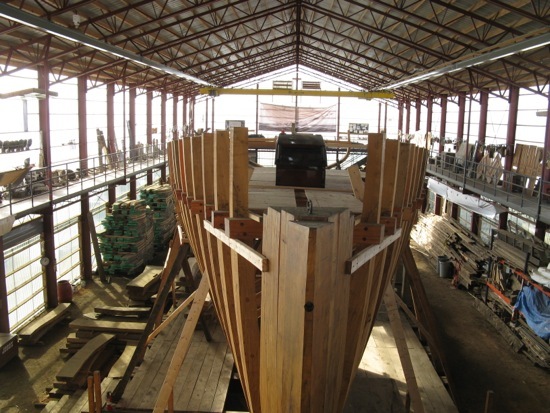 If you stop by to see Coronet under construction, there’s a good chance that you’ll be impressed by the sheer size of not only the vessel but of the shop space surrounding her. It’s a very large building, and yet, there still is never enough room. 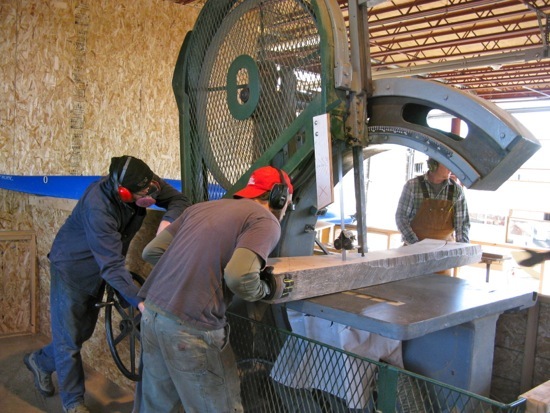 You can see the stacks of lumber drying to the left. There is just as much on the other side of the shed, although much of that is salvaged ceiling planks and other timbers from the deconstruction. There are also stacks of stock that have been marked as possible frame stock, and this needs to be sorted through. One way to do this is to lay out as much stock as possible and walk through it with the patterns of the futtocks to be made. 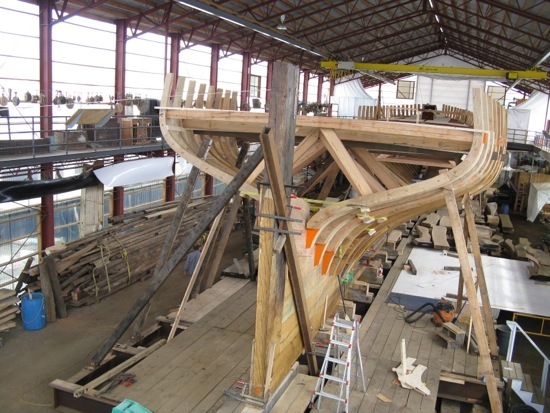 As you’ve seen previously, a boat of this size requires a lot of framing stock. 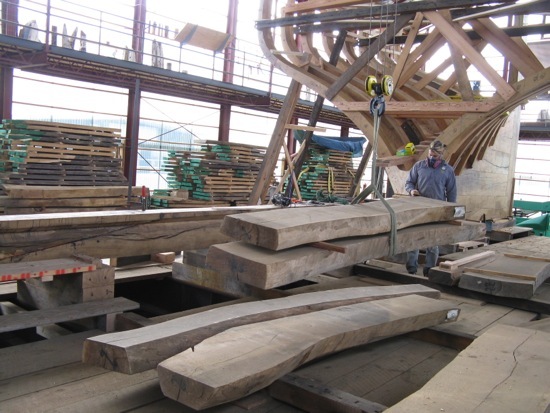 Those thick slabs of oak are carefully marked, rough cut with a chain saw and then finish cut on the ship’s saw. 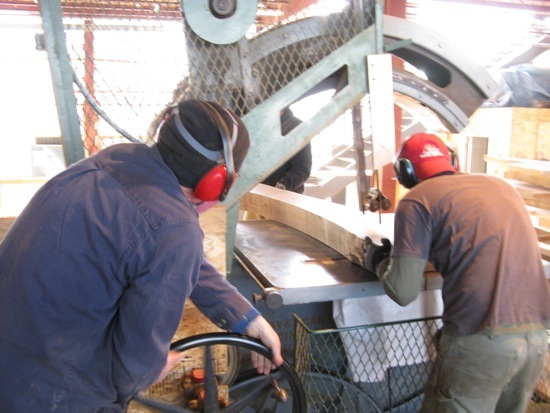 The ship’s saw allows the crew to cut both the shape and constantly changing bevel of the piece at the same time. 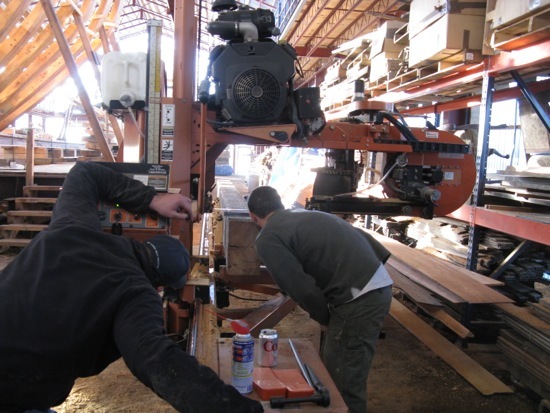 One or more people guide the wood through the saw, while another person changes the saw’s bevel angle as the wood passes through the blade. It’s a carefully choreographed operation. 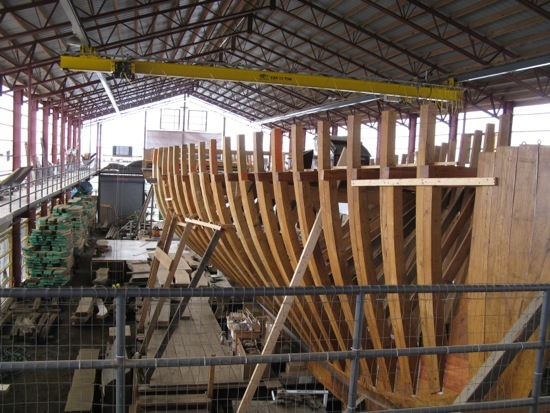 A boat the size of Coronet requires a huge amount of wood. 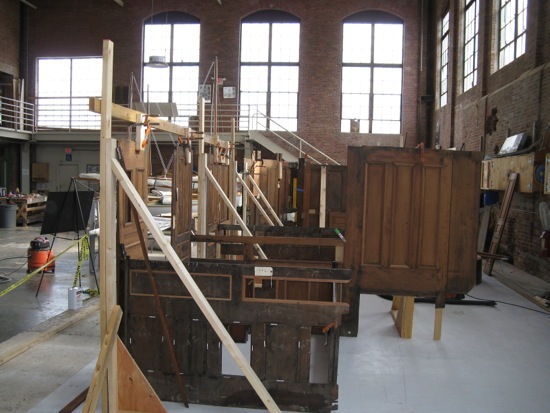 We’ve been fortunate to work with Ken Beck of Newport Nautical Timbers. 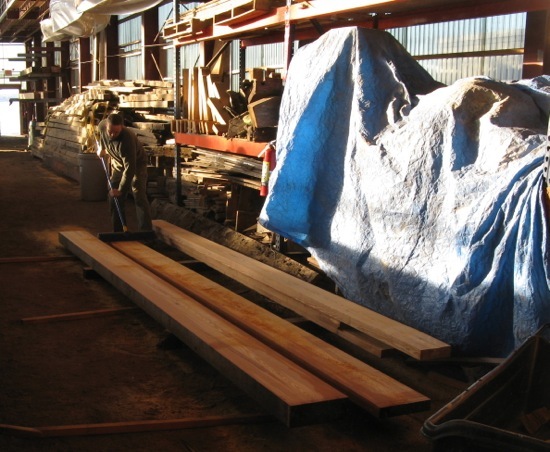 Ken has recently found some beautiful yellow pine that’s been reclaimed from an old mill building. 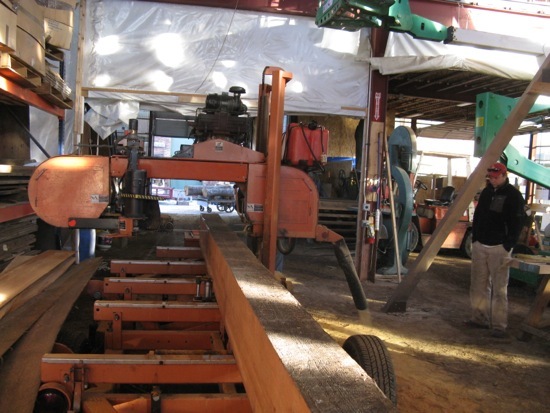 He can bring his portable Wood Mizer sawmill right to the shop to cut boards to our exact specs. 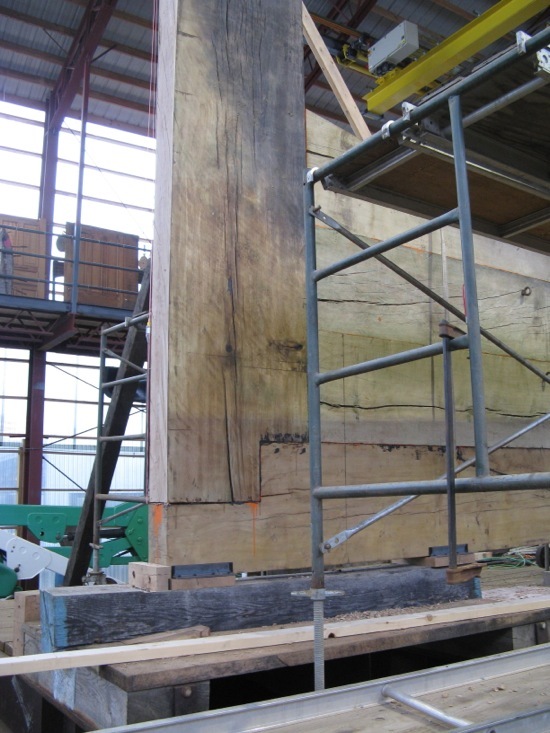 You may recall seeing the large mortises and tenons used to join the rudder post and keel, here they are now assembled. 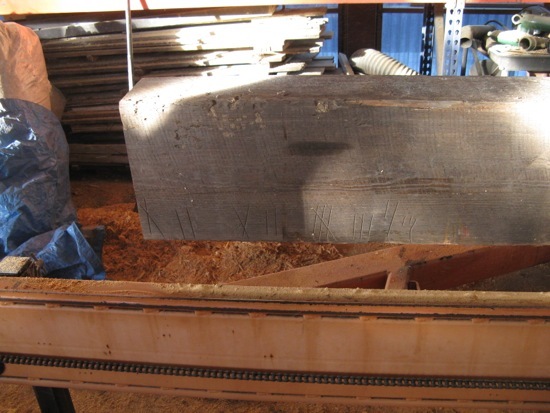 You can see the diagonal scarf joint that connects this last section of keel to the longer sections forward of it. 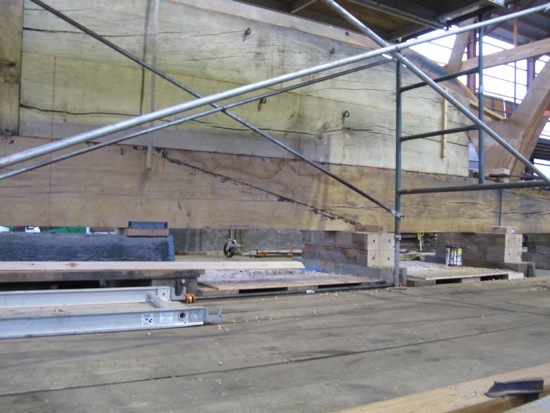 The frames and deck beams at the bow of the boat have been installed for some time now, and aside from setting up temporary decking there, not much is happening at this end of the boat. If you’d dropped by IYRS over the summer, you would have gotten a taste of what it will eventually be like while on Coronet. 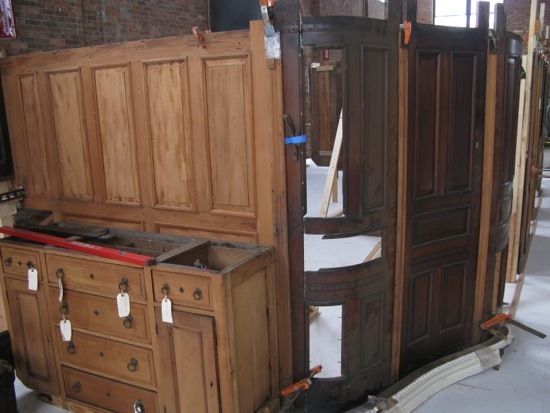 Many of the interior cabinetry and bulkheads were mocked up on the shop floor to give a full-scale sense of the boat’s living quarters. 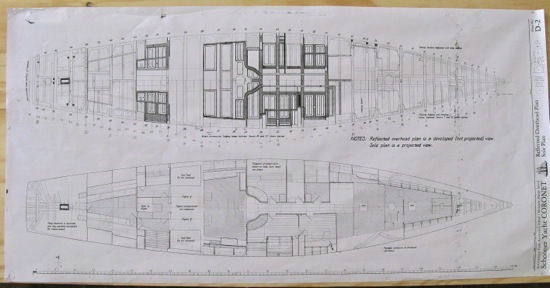 Coronet has been completely lofted and laid out in computer generated drawings. The crew uses these drawings to accurately map out the exact space available below decks onto painted platforms on the shop floor.